Even if you can tolerate gluten, it’s great to have a recipe for a sweet treat for friends and family who can’t. This recipe is YUMMY and so super easy! Just mix the brown sugar, peanut butter and egg together. For bar cookies, stir in about 1/2 cup chocolate chips, spread mixture into a 9×9 pan and bake for 20 minutes at 350 degrees. For cutesy cookies, place a small scoop into a mini muffin paper (using a mini muffin pan), put a chocolate star in the middle of each and bake at 350 degrees for 10-12 minutes. And that’s it! Easy and yummy…that works for me! These were one of the first baked goods that I made when my family went gluten free. Yummy!!! Sounds yummy & easy – the best of both worlds! I’m looking forward to trying it. How thin were your cookies? Mine turned into a crumble but I might have made them to thick. At least the crumble tastes good. Oh, I’m sorry yours didn’t turn out so nicely! Mine were on the thick side I guess. If you mix these up again and they seem to be crumbly, add another egg and see if that helps. I made the peanut butter bars with chocolate chips today for my son and he loved them. He gave me a big hug and told me how much he loves me and loves the peanut butter bars. It was totally sweet. As my son would say, “Laura, you rock.” Thank you for the recipe. Hi! I am looking for cookies that work well with cookie cutters. Do you think cookie cutters would work with this recipe? These are awfully sticky – without flour they wouldn’t roll out very well for cutting with cookie cutters. If you made them into a bar cookie, you could probably use a cookie cutter after they are baked to cut out shapes. 8 months pregnant here and needing a yummy late night snack. 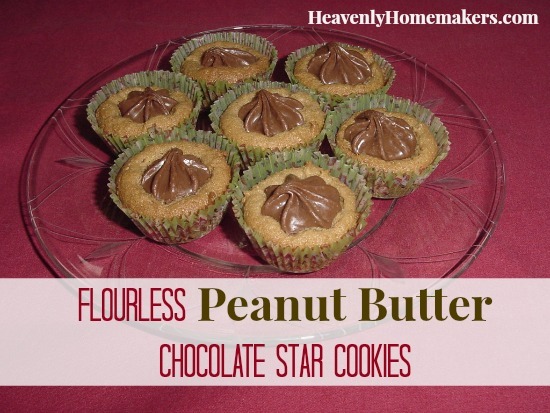 I was craving peanut butter and chocolate and just knew you’d have a recipe I could use. PERFECT and simple! Thanks! Yes, it’s normal for them to be soft, but I’m surprised they weren’t burned and crispy after 20 minutes. Funny how different ovens bake so differently! I always use: 2 eggs, 1 cup natural/turbinado sugar & 1 cup natural peanut better – yummy! They freeze really well too. Sherry – when making the round cookies, I always have to flip one over to see if it’s brown on the bottom to know if they’re done! Laura, when you say “brown sugar” do you really mean the real brown sugar or are you referring to sucanat or evaporated cane juice crystals? You can use either one…I’ll edit the post to say that! one more thing…which is better turbinado or organic sugar. trying to make my family healthier but there are so many different items out there, I am starting to get confused! My understanding is that turbinado is a little bit better than organic sugar. This recipe looks awesome! I can’t wait to try it. Do you know if egg replacer can be used in place of the egg? We also have egg allergies. I don’t have any experience with egg replacer, so can’t say for sure. But I would imagine it would work! Yum! I just made these and they are good! We are not gluten free but have friends/family who are so this will be a nice treat to share with them. Wow! I can’t wait to make these again! Next time I’m not going to take them to a potluck where we have to share them. I am going to try these cookies for my friend who can’t take gluten! Thank you. I am so happy that I found this site, my 5 year old has class mates that cannot have gluten and this will be a great way for them to be one of the kids, as everyone can have the same things. Thanks so much for your site.